Andre Hal played for Vanderbilt from 2010 to 2013 at cornerback and on special teams as a returner. His best year came in his Senior campaign in 2013 when he earned Second Team All-SEC Honors with 3 interceptions, 49 tackles, and 18 passes defensed. With his fleet speed and athleticism, Andre had the chops to play in a man-cover system, on special teams, and possesses solid intangibles. He’d be there in the 7th round for the Texans to select him in 2014. 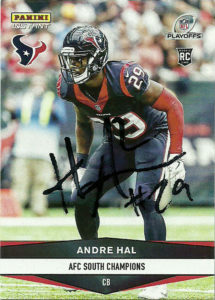 Looking back, not only is Hal turning out to be a true diamond in the rough, it was a no-brainer for the Texans to select him for their well trained secondary. 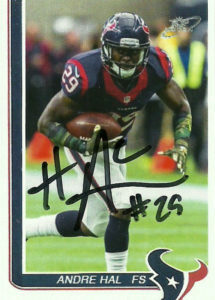 As the preseason continued Hal made enough of an impression to make the squad, despite the Texans impressive depth chart. He finished his rookie season with 15 tackles and 4 passes defensed at cornerback. The Texans had a need at safety. They had tried platoons and the fiasco that was Ed Reed in the previous years. Hal just wanted to contribute any way he could. He made his first career 2 career interceptions against Jacksonville in Week 6, taking one 31 yards to the house and spurring the team to a 34-20 win. He finished the year with 4 interceptions for 54 yards with that TD, 10 passes defensed, and 34 tackles, playing all over the field from linebacker to both safety positions over 11 starts. Andre returned for 2016 as the starter at free safety. Again through 11 starts, Andre had 2 interceptions for 36 yards, 7 passes defensed, his first career sack, and 46 tackles for the NFL’s leading defensive unit. I was willing to pay a premium to get a card- any card of Andre’s for this event. As it stands outside of a Leaf 2014 certified autograph, there were no base cards of Hal made- and despite his performance in the secondary, he’s never registered on a Topps or Score card. I payed a fat premium to get this Panini Instant card of him. It’s a nice card, but very basic, and way too many logos for my liking- even if they are balanced on both sides. My thought is that the logos should go down the left side of the card. This would make them appear as badges. Also this card is an error card. 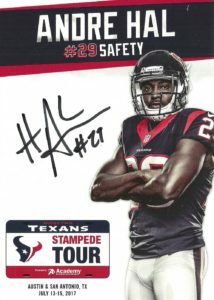 By the point this card was issued in 2016, Hal was exclusively playing free safety (FS). Hal’s autograph is a unique spin on an otherwise exhausted signature. Most players who have an ‘A’ to start their name overdo the size or turn it into a star, but in Andre’s case he cleverly centers it to cross through his first and last name.